You could hear the thunder throughout the building and see the wall-to-wall smiles on students and faculty attending the first of a three-part Percussion Residency educational program at the nationally recognized Rainey Institute on Cleveland’s east side. READ THE FULL STORY CLICK HERE! PERCUSSION IN THE SCHOOLS (PITS) – A flagship program that can bring PMC authorized professional program facilitators into schools for all-school general assemblies throughout the US. Get involved and make a difference! Percussion in the Schools is an educational in-school performance program targeted to introduce and provide first time professional percussion playing experiences in elementary through high school levels. Interactive concerts are presented to the complete school student body; inspiring children with first-time percussion instruction by PMC qualified professional facilitators and ensembles. Everyone participates including teachers, administrators and attending parents. Each year the PMC collaborates with over twenty-plus hosting schools bringing first-time percussion experiences to over fifteen thousand students. This positive experience in playing percussion—many for the first time, is often a life-changing turning point,..finding music making a life-long partner. 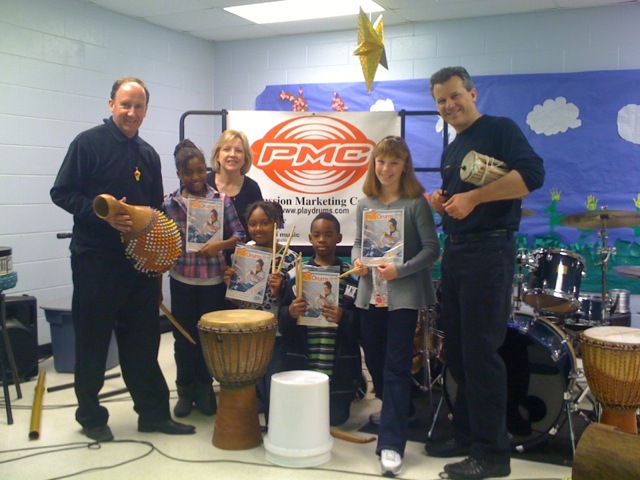 Primary authorized PMC Program Facilitators for Dancing Drum, Atlanta Percussion Trio, Hands on with Zig, Matrix Percussion Trio, Maria Flurry of Sticks & Tones, Bob Bloom of Drumming About You, and Mark Powers. PERCUSSION MARKETING COUNCIL PARTNERS WITH CLEVELAND FEDERATION OF MUSICIANS, Brings PERCUSSION RESIDENCY to Rainey Institute. An educational collaboration between the Percussion Marketing Council (PMC) and the Cleveland Federation of Musicians (CFM) brought a whole new dimension of percussion experience and education to approximately fifty Rainey Institute students as part of a three-day Percussion Residency. The relationship was launched during the May 2014 International Drum Month campaign and has since seen interest in playing and learning about drums and percussion expand tremendously. Recognized for its exceptional hands-on approach to student education, the Rainey Institute welcomed the opportunity for hosting the PMC’s Percussion In The Schools program, sponsored by the PMC and Cleveland Federation Local 4 Trust Fund. Three distinctly different percussion learning programs brought students to a better understanding of the many different instruments and sounds associated with drums, percussion and player-performance requirements. “AN INTRODUCTION TO THE PERCUSSION SECTION”….Students of all ages learned to play basic orchestral percussion rhythms by playing along with recognizable music from Lion King, Lady Gaga, Pink Panther, Michael Jackson’s Thriller and a Sousa March. Moderator and PMC Executive Director, Karl Dustman provided demonstration and basic instruction-playing techniques for all orchestral instruments, from timpani, cymbals, snare drum, congas, bongos and many hand-held accessories. “PERCUSSION IS MELODY, HARMONY & RHYTHM” , DUO ANIME Percussionists, Mell Csicsila and Andrew Pongracz dazzled enthusiastic students with an introduction to different percussion styles and mallet keyboard instruments including marimba, glockenspiel. Early military drumming communication rhythms and call-to-action were demonstrated on vintage marching snare and bass drum instruments. HANDS ON DRUM CIRCLE QUARTET,… Percussion Facilitators, George Kiteley, Jay Ganser, Dan Price and Karl Dustman got every student involved playing a dozen different drums, hand held shakers, tambourines, guiros, triangles and more for a grand finale participation. Why Learn To Play Music brochures were provided by PMC and NAMM Foundation as parents take-home information. Rainey Institute Percussion Residency students with Facilitators, back-row left to right: Dan Price, Jay Ganser, George Kiteley and Karl Dustman. According to Cleveland Federation-Local-4 President Leonard DiCosimo and PMC Executive Director Karl Dustman, other similar educational outreach initiatives are being planned as both organizations see percussion as the most common easy-access to get all students started playing a music while increasing an appreciation for the Performing Arts. The (PMC) is the official Percussion industry’s trade association comprised of members representing the manufacturing, distribution and publishing facets of the percussion world. Founded in 1995, the non-profit all-volunteer organization consists of an Executive Committee and Advisory Board dedicated to increasing the public awareness of drums and drumming, while creating educational and market development programs and campaigns that reach all audiences and benefit all music retail merchants in all regions. The PMC has been a consistent recipient of the NAMM Foundation, receiving annual funding for the percussion In the Schools and Roots of Rhythm programs along with other music making campaigns and initiatives. Since 1974, The Cleveland Local 4 Music Fund has been presenting educational programs and free concerts to introduce and expand the musical knowledge of each student in the classroom. At the same time it organizes and works with co-sponsors and municipalities throughout Northeast Ohio to create unique local music events. With a mission of prompting the appreciation and understanding of LIVE MUSIC, performance takes on a whole new form of musical enjoyment. Rainey Institute celebrates the talents and strong character of our young people who use their outstanding abilities to provide quality artistic experiences for appreciative audiences. The Institute is passionate about the power of the arts to meaningfully transform young lives through a community of dedicated teachers, artists, students, parents, board members and volunteers who embrace the arts as a vehicle for nurturing creativity and goodness in young souls. With humble beginnings over a hundred years ago, the Rainey Institute was founded by a pioneering social worker, Anna Edwards, and a philanthropist, Eleanor B. Rainey. Mrs. Rainey financed Miss Edwards’ arts and educational program as well as paying for the construction of the original building to house its operations. Since then the Institute has constructed and moved into a state-of-the art educational enrichment building which concentrates on all forms of artistic expression through the cultural arts of music, theater art and graphic design.